Like many of the recipes I share here, I received this one in an email from Kraft Food. It looks so good and I love chocolate so I knew I had to share it with you guys. I think I just may have to make this for Thanksgiving. -BAKE pie crust as directed on package for unfilled one-crust pie; cool completely. -MELT chocolate as directed on package; cool slightly. Beat butter and sugar in large bowl with electric mixer on medium speed 3 min. or until light and fluffy. Add melted chocolate and vanilla; mix well. Add egg product. Beat on high speed 2 min. or until light and fluffy. Spoon into pie crust. -REFRIGERATE 3 hours or until chilled. Top with the whipped topping. Store leftover pie in refrigerator. 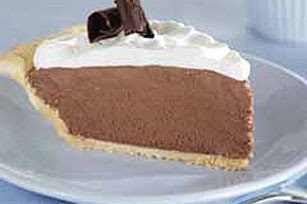 Unlike the traditional Chocolate Silk Pie which contains uncooked eggs, this pie uses cholesterol-free egg product, eliminating the risk of exposure to salmonella. Mmm, silk pie is one of my favorites! And I LOVE chocolate too!